The support from our friends and alumni has been very strong and, as a consequence, the EAS Division has received several extraordinary gifts. Walter (MS ’82) and Marcia Kortschak have established the Kortschak Scholars in Computing and Mathematical Sciences Fund, which endows up to 10 graduate fellowships annually. This fund is designed to support students during their first two years at Caltech and allow them the utmost flexibility to explore areas of research that are in the earliest stages of development. The Kortschaks’ creative vision and generosity offers both a means of continuing to bring the brightest students to Caltech and a way to broaden research forays into highrisk, high-reward areas that do not always benefit from traditional funding sources. Also sustaining the Division’s continual venture into uncharted territory is the endowment of the Mechanical and Civil Engineering Leadership Chair by Cecil (BS ’50) and Sally Drinkward. In an interview with ENGenious last year, Cecil Drinkward succinctly described his vision for the future of civil engineering: “We need to be able to—and willing to—think out of the box when training the next generation of civil engineers.” And to this end, the leadership chair established by the Drinkwards will provide funds in perpetuity to support educational and research initiatives that push boundaries and build on new ideas. His legacy will reverberate through generations of faculty and students. Finally, I am delighted and honored to announce that, for the first time, a department at Caltech has been endowed. 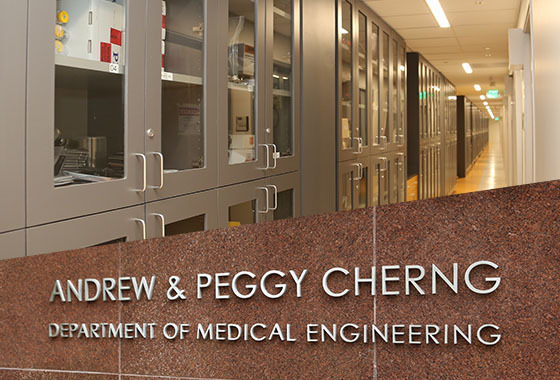 The Division of Engineering and Applied Science has become home to the Andrew and Peggy Cherng Department of Medical Engineering. The Cherngs’ gift is congruent with their commitment to “paying it forward” to improve the quality of life for people in their community and around the globe. As Peggy Cherng explained, “We are here to build the American dream, but not just for us.” This gift allows EAS to build upon the transformational research and educational approaches already under way and seed future breakthroughs in medical technologies that will have worldwide impact. The Division’s distinct advantage in this area is that we are able to apply our unique and deep-rooted strength in micro/nano-devices and optical imaging to address medical challenges. “From Bench to Bedside: New Paths, Sharper Resolution, Inventive Devices” reviews recent work in medical engineering by four faculty actively working in these fields. The global perspective is driving research across the Division. Within the last few decades, we have seen and will continue to witness increasing urbanization worldwide and the formation of more megacities with populations exceeding 10 million: 31 as of 2016 and 41 projected by 2030. The complex challenges that these megacities face in the areas of physical and digital infrastructure, transportation, and recovery from disaster have inspired new research directions for many of our engineering faculty. “Making Megacities Resilient (Starting with Los Angeles)” describes some of these efforts. The future of information and communications is explored in this issue of ENGenious by way of describing advances in quantum engineering, an emerging area in which our collaboration with exceptional quantum physicists gives us a distinct edge. EAS quantum engineers rely on the tools and campus-wide research community of the Kavli Nanoscience Institute, which provides state-ofthe- art facilities for exploration of quantum phenomena in exquisite detail. “Quantum Engineering: A New Frontier” delves into the work of several leaders in this field—a field that is poised to entangle, reroute thinking, and deeply transform myriad technologies for future generations. EAS alumni have experienced firsthand the extraordinary community of scholars that defines Caltech: a collection of students and postdoctoral scholars who come from cities across the country and countries around the globe. No matter the path our scholars take to arrive, or what path they might forge after they leave, it is essential that in addition to their outstanding technical ability, they are able to effectively communicate their ideas, discoveries, and innovations. Communication is one of the essential skills possessed by leaders, as well as the ability to tolerate ambiguity and deal with crises. Our students are excellent problem solvers, and when they extend their problem-solving gifts to the areas of communication and interpersonal relationships, they are poised to become great leaders in their communities. Two such leaders in academia and industry, Richard Muller and Dan O’Dowd, are profiled in this issue. I wish you the greatest success personally and professionally, and, as always, I look forward to receiving your thoughts and comments.